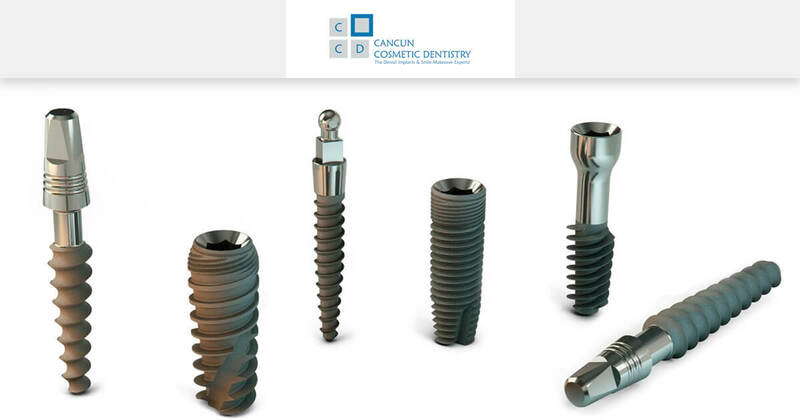 Types of Dental Implants in Cancun Cosmetic Dentistry! You are here: Home / Blog / Cosmetic Dentistry / Different types of Dental Implants in Cancun Cosmetic Dentistry! When looking to restore the look and functionality to a missing tooth on your smile, there are many types of dental implants and techniques we can use. Our dentists are proficient on all types of dental implants and protocols from the most recognized dental implant brands in the world. In fact, Doctor German Arzate is an expert and has specialized himself on dental implants: regular, narrow, wide, mini, etc. What’s the difference between these dental implants and what’s the deal with them? Well, most dental implants are made of Titanium (though there are some made of zirconia) because this is the most biocompatible material with the human body. This means that the rejection rate from the human body with titanium implants is very very low compared to other materials. Depending on your dental need and the state of your mouth your dentists will give you extensive information about the best type of implant to use in your case. For example, narrow implants could be an option for a front tooth on the bottom jaw where your other teeth are narrower than, say, your molars. The size of the crown to be used on your rehabilitation process months later will also come into play. If you have big teeth, you will need a big crown too and a narrow dental implant might or even a regular implant might not be enough to place it. Finally, the bone volume and density on you jaws is a deciding factor for the type of implant you need to use. Your type of bone will also stipulate how long you will need to heal for the second phase (rehabilitation) to place down the crown and finish your treatment. Dentistry tips for Halloween! Plan your All-on-4 smile makeover in Cancun!